The PBS39 Good Neighbor Awards are given each year in the spirit of Fred Rogers of Public Broadcasting’s program, Mister Rogers’ Neighborhood. Rogers’ legacy of education, community, and compassion continues today, and his belief that we should “always look for the helpers” inspires this award. The awards honor those ‘Good Neighbors’ who assist with PBS39’s mission to promote civic engagement, and to fulfill the regional needs of the Greater Lehigh Valley through its dynamic communication platforms and resources. The largest impacts are made when organizations and individuals band together for a common vision of a community that is inspired, engaged and vibrant. Father Dan Gambet, a beloved pillar of the Greater Lehigh Valley community, served on the PBS39 board of directors for the better part of 40 years. The impact of his knowledge, kindness, goodwill and spirit has contributed to the powerful draw of the Lehigh Valley as an amazing place to live, work, and study. During the years he presided over DeSales University, Father Dan good-naturedly roasted many a colleague. 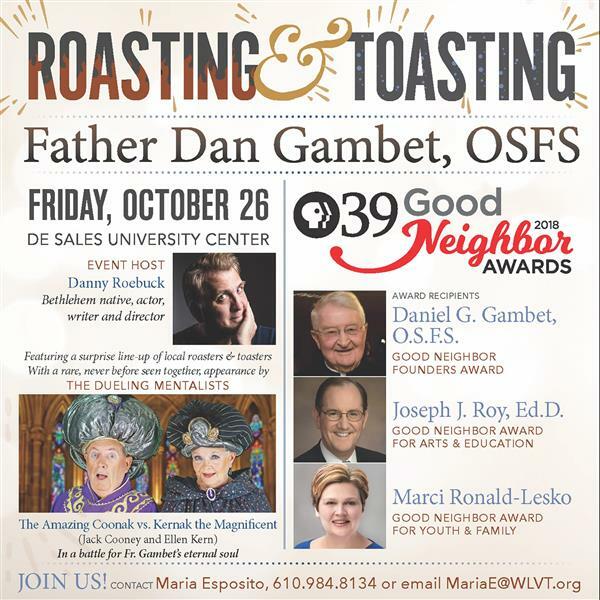 This time, it is PBS39's great honor to pay tribute to Father Dan as we gently and lovingly roast him.